I just LOVE this image- I hope I did it justice! 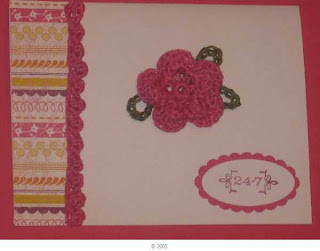 You cannot see in the picture the Sakura Gelly roll pen adding shimmer to the little circles in the medallion centers. Happy Friday! I don't know why, but simple cards take me hours to make! This started when I was cutting cardstock in a Mover and Shaper Die....to bad it was not mine........anyway, I looked at the shape that was cut out and decided it looked like an ornament......... I stamped and embossed a snowflake from SU Snow Swirled, added a silver Eyelet and a gingham ribbon 'hanger'. I can imagine all kinds of ornaments made from the shapes I cut out from the Matchbox Die shapes too. (And, I am sure some creative SU demo thought of this AGES ago!). Background DP is Cottage Wall and Merry Moments both from SU. The Sentiment is stamped on a tag from the Matchbox Die. I made this for dual challenges today- to have an eyelet for the Bloggers challenge for Sweet Dreamers (SCS) AND fit the sketch challenge for the Bloggers Challenge group. I love to try to make a card to CASE the Featured Stamper on Splitcoaststampers each Sunday....does not always happen, but I love it when it does! 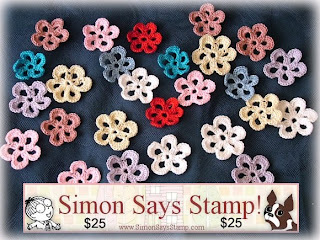 This Sunday, the Featured Stamper is joanne or jojot. I picked this card from her gallery- and then was to change three things. First, no DP- I made a BG called Ai Foil from the TJ newsletter. No punches in the corners, no pearls or brads- just added piercing. I colored the image with Copic markers- the image is a free digi download from this site (If you have trouble finding it- look around July 24-27th) and I originally found it on SCS when another papercrafter uploaded a card using it. I need alot of practice with the digi images to figure out how to resize them and make them larger or smaller. The last time we needed new printer ink. I went to a 'cartridge refill' store. The color of the printing has a green hue to it after I print an image or two, so it is hard to also figure out how to not print in the middle of a page when I print just one or two images.....- lots to learn....but I guess I have a lot to learn to catch up with modern technology. One more thing I found this morning while looking for digital image info this post on Free Vintage Digital images every Tuesday Now these look outstanding, don't they??? I would love to know what sites or sources you use for digital images! PS I am going to send this card to my Technique Junkie swap card partner for August. We have a Just One swap, where we have a partner and I send her a card and she sends me one. It is optional and I would guess about 40-50 ladies participate each month. It is a fun way to see not only beautiful cards, but have a first hand look at techniques from the TJ newsletter. Oh, if you are interested or curious, Here is a link for the site- if you go there and get hooked...don't blame me!! 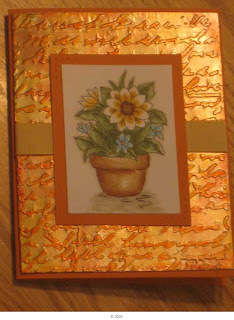 I have been playing around with markers- for this card, I colored in the outlines of the leaves and water colored with the Aqua painter. I used regular SU Whisper White on the BG strips for the water coloring. I am going to send this to my nephew who just started college- that makes my sister and her husband empty nesters..... we have 2 more years and that will be us! This is a card I made for two challenges this week. 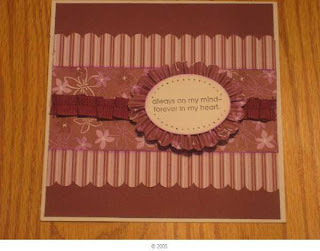 The sweet Dreamers Blog Group on SCS has a challenge to focus on words on a card- the sentiment is the main focus here. The CS is Razzleberry. I cut the DP just a pinch smaller than the Razzleberry layer, cut it in 1/2 (the stripes are on the opposite side of the flowers). I cut the stripes in 1/2 again and scallop punched the edges. The ribbon is razzleberry, and the dotted side is face down. I gathered it and used the sewing machine to apply it. The oval has DP that has been put through a crimper, the gathers tighened up by pinching them closer, and then gathering it around the edges of the oval- it is glued with Tombo Multi Mono. I have an oval on each side of this gathered DP. 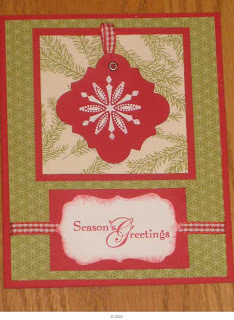 I stamped the sentiment from Always and pierced the edges prior to adding the oval to the 2nd side. I lightly sponged Razzleberry around the edge of the oval. 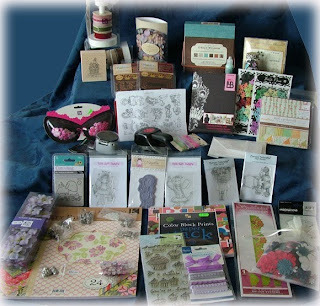 I had a little time to stamp Sunday, and joined in the Featured Stamper Challenge at Splitcoaststampers. 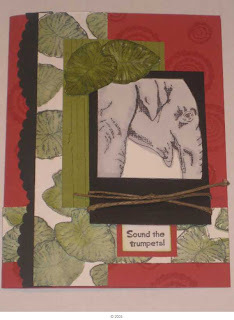 The Featured Stamper this week is Stamp Muse, and here is her card that inspired me. 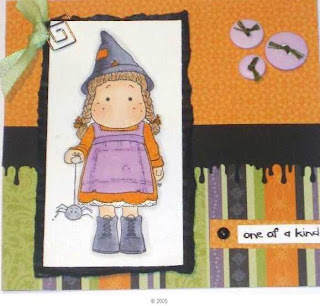 I did not have a Patriotic Tilda, so chose to use Halloween as my theme- for the challenge, you are to change 3 things about the FS card. I used DP with a Halloween theme and colored Tilda using Copic Markers. I used a Torn Frame technique from a past TJ newsletter, which I liked with the Gooey punch I used in the middle of the card. I love the colors for Halloween and enjoyed making this card. Bev is on the verge of hitting 400,000 hits........(I cannot even imagine.........) Here are pictures of the candy- Drawing to be done 8/17 and is open worldwide. I signed up- wish me luck............. Let me know if you sign up too! 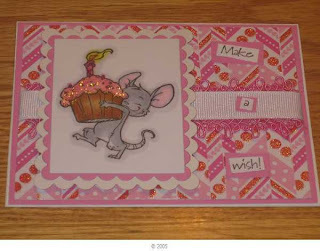 My little GIRLY GIRL niece is turning 7 this month, so I decided to make a Girly Girl Birthday Card! I guess this could be considered a grid card for the Sweet Dreamers Blog group (from SCS)- it is called Zig Zag and it is from the latest Technique Junkies newsletter. 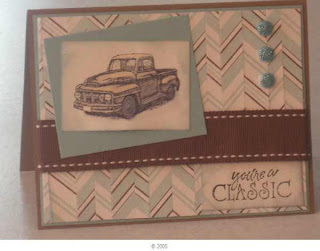 The tutorial was written by Ann Clack- stampsandcars on SCS- one of my favorite stampers! Anyway, I also got out the Copic markers and went to town- this was just a riot to color-and to glitter. The BG is a piece of scrapbook paper from the dollar bin at Target I bought last Valentines Day. The image from Whiff of Joy is from an image swap on SCS and the Sentiment is from Mini Mates (Stampin Up-long retired). I am busy making ATC's for a Flourishes swap- and I decided to just make more so I can send some to Juliet A for the Technique Junkies ATC Technique Swap. (I made 18 of these in all). I join the TJ swap to get samples of techniques by others- and it is a nice way to see techniques I may or may not have tried. Deb Lovett put it nicely- the ATC cards are like having a little autograph book that other stampers sign- with their creativity (OK, not an exact quote.....). Not an easy BG to photograph- more vibrant IRL....BG is Faux Sanding and the SU paper is retired Rose Romance-one of my all time favorite colors! I used the Scor Pal to make a grid around the outside edges, then took a Sakura Jelly Roll Pen and wrote over the scored line to get some sparkle. The Flourished Sweet Peas are colored with Copics RV00, R81, R83 (I cut out the 5 flowers and glued them over a black stamped image- am I crazy or what???) 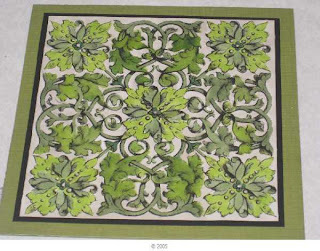 and I ended up using Green Galore to color in the greenery on the ATC. I added 5/8" sheer organdy in White to finish off the ATC. Now, to get them in the mail! Well, I am back and running! I have been doing laundry and grocery shopping and catching up.......from a very relaxing week away in Kentucky. I spent the day making some TJ backgrounds to finish later, and also a challenge card for the Sweet Dreamers Blog Challenge Group. I think the CAS cards are very hard! single crochet, double crochet, single crochet. 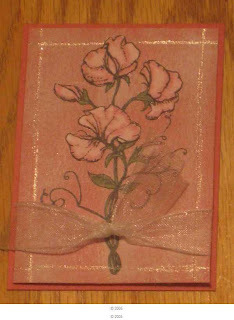 I sewed it onto the card with coordinating thread. Thanks for looking! Thanks for stopping by.